Certainly the Canadian re-developers of the airport comprised of the Canadian Crown Corporation, [CCC] and their Canadian partner in the deal Aecon, must now feel that their Bermuda fairy tale has indeed come true or soon will be. The airport re-development project appears to be moving fast despite the rising opposition and the Donald Trump style wall built by Finance Minister Bob Richards which at least for the time being is sealing off all access to the critical aspects of what he terms the so called “interim” agreement that was signed between the developers and the Ministry of Finance. In fact, the Finance Minister unlike Donald Trump who at least has promised to make the Mexican government build his wall – from what we now know has decided to build his – solely on the tax payers dime. In Bermuda you know when it has reached critical mass when both black and white Bermudians begin to sing from the same hymnal as appears to be the case now in opposition to the deal. Not only has the Opposition been stymied in its attempt to obtain the relevant information from Minister Richards in order to fulfill its constitutional duty in this matter but the list of other entities who have also came up against Mr. Richard’s wall is beginning to read like a who’s who. Firstly, with respect to the Public Accounts Committee or PAC which is chaired by the Shadow Minister of Finance, the level of obstructionism exhibited by the government here has been farcical. Last week for example respective government members of the committee refused even to show up for a scheduled meeting in order to stonewall the process of disclosure. Both M.P Susan Jackson and the Finance Minister even sought to advance the thoroughly dubious and wrong proposition that PAC Chair, Mr. Burt did not have the authority to even issue summonses without I assume the blessing of the One Bermuda Alliance members. This view of course is not shared by the Speaker of the House who is the ultimate authority. In other words the summons issued to Permanent Secretary of Finance Anthony Manders to appear before the committee is valid and should be honoured as he tried to do – I assume – last week. Secondly, the daily, was denied a freedom of information request in relation to the project on two separate occasions by the Ministry of Finance. The respective parties were seeking the nine schedules that are a key component of the signed initial agreement, along with any other relevant information. Returning to the issue of the tax payer’s dollars, Shadow Minister of Finance, David Burt recited what amounts to a bill of indictment against the deal at a recent Progressive Labour Party town hall meeting in St. Georges’ that gets longer by the day. Disputing the $250,000 per month estimate of electricity cost for the completed airport that he has committed to underwrite, Mr. Richards now asserts that the figure is more likely to average approximately $190,000 per month in line with current usage. But even at the $190,000 per month average it will still result in Aecon and/or the Canadian operators of the finished airport obtaining an obscene windfall of approximately $2,280,000 per year. This amounts to a $68 million dollar tax payer subsidy over the 30 year life of the proposed agreement. As to the above assertion by Shadow Minister Burt that the Finance Minister has committed to underwrite the cost of electricity at the airport, Mr. Richards failed to repudiate that claim at a recent press conference held this week. But let us not stop there. For this to truly be a romantic fairy tale between our government and their preferred Canadian developer who I might add did not even have to go through a more normal courtship by way of a competitive bidding process it required much, much more. It appears that in order to convince the developer and operator of his unbridled affection, the Finance Minister has committed to also exempt them from paying the employers share of payroll tax, customs duties and work-permit fees. The Canadians were in addition, granted a very favourable termination clause that allows them to back out of the deal at anytime during this phase, with the Bermuda government obligated to pay them for the privilege of doing so to the tune of potentially millions of dollars. This and the other incentives – some of which are not outlined here – are a clear example of how the risk transfer model undergirding this deal is skewed too far in favour of the Canadians. This is ensuring that the value proposition associated with this project as touted by the Finance Minister may indeed be illusory when all is said and done. As noted last week, the little we do know reeks of government desperation and it appears, outrageous political overreach. 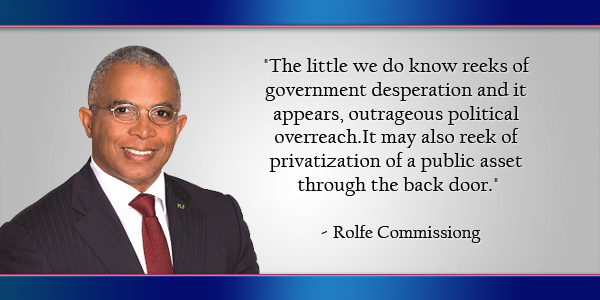 It may also reek of privatization of a public asset through the back door. Both sides sincerely wish to see Bermuda’s economy generating jobs and opportunity for Bermudians. However, the emerging outlines of this deal which have managed to seep through the growing cracks in Minister Richard’s wall of obstructionism increasingly give us and growing numbers of Bermudians pause. And they should do. Take a seat Rolfe. All that spin must be making you dizzy. Perhaps W&E should be building it. Well I am not defending the deal but I am sure glad the plp are not getting their hands on it. Can you say Berkley, Port Royal, Grand Atlantic etc.? I don’t even think the airport should be a priority but some who know better than I do say it is a priority and the plp even came up with a plan ages ago that would have cost double. So build it and move on. Me thinks that Rolfe and others are making a lot of noise the same as always….Can we have an update on the Commission of inquiry? Let’s say that the faux outrage is growing. Par for the course at this point. Must be Rolfe’s turn to go to the press &make noise this week. Desperate to make something out of nothing. Distraction from the COI. Nothing more. St. Helena is building an airport. The whole thing; terminal, runway, taxiways, and all services required by an airport (ATC, fire, fuel, etc). They are blasting a mountain to accomplish this on an Island 2400 miles from the nearest land. The two prjoects are hardly comparable. One interesting thing. St Helena picked the developer/operator for this Public/Private partnership after a comprehensive and inclusive bidding process. I wrote on the completion of the airport in St.Helena a few times last year. So I’m hoping Ginny The Deputy Governor will bring back to Bermuda enough info to jolt Bob/UBP/OBA back to reality . The airport is privately administered and has been for decades. Nowhere in this article has the writer indicated any evidence to suggest that private administration of the airport will alter ultimate government ownership. In fact, using the word “operator” indicates that he clearly understands how the projected arrangement will work. I appreciate that the writer isn’t particularly interested in presenting good faith criticism of the proposed airport development (so much for ‘bipartisan reform’). For fair-minded PLP stalwarts, though, it is worth asking: If the writer is prepared to elide this distinction, what else is he not telling you the truth about? False. The airport is operated by the Government Department of Air Operations. Prior to that the civil air operations were run by the Department of Civil Aviation with airport operations handled by the US Navy. There was a short transitional period where Government hired the management company, Serco, to manage air operations. I could agree with you that conduct of the airport is overseen by that Department, yes. However the day-to-day administration of services (maintenance) was carried out by Serco for twenty years. Rolf, Please stop embarrassing yourself. The people of Bermuda are not stupid and can identify a strait up waste of funds. Well they say if you don’t listen you would feel I give it a week.